Contemporary cities are in need of public spaces which work better for their citizens. 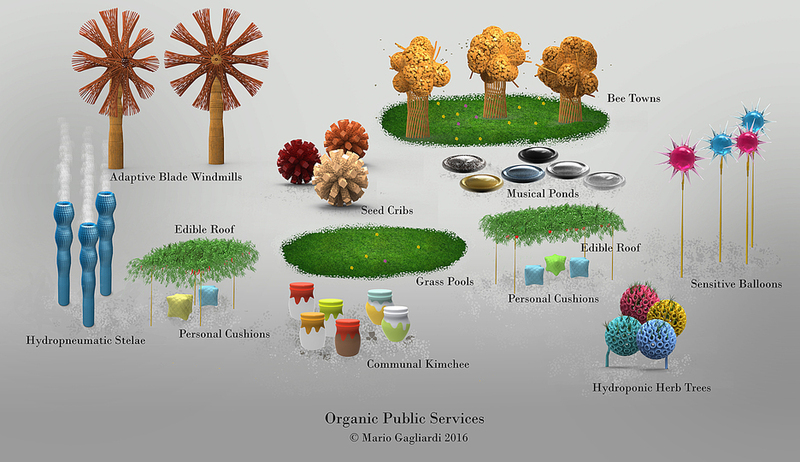 This proposal is based on modular design elements which together create an ecosystem for public spaces. Attempting to bring nature and the community back together in the city, these elements are designed to be easily installed in existing public squares. Adaptive Blade Windmills, crafted in wood, continuously adjust their blade shapes to catch wind at the optimum angle for small-scale power production for local communities. Seed Cribs (wooden structures containing a variety of flower and plant seeds), Hydropneumatic Stelae (structures producing water and water vapor), Musical Ponds (small water basins emitting subtle sounds on the basis of the movements of water), Bee Towns (crafted beehive communities), Edible Roofs (pavilions with roofs of chillies, peppers and other vegetables), and Grass Pools work together to ensure the survival of a biological ecosystem with seeding, watering, pollination and growth, while providing experience and enjoyment for the senses. Hydroponic Herb Trees (structures for hydroponic herb growth) and Communal Kimchee containers attract visitors also in the winter months. Communal Kimchee, Seed Cribs, Sensitive Balloons and Personal Cushions are unlocked by personal smartphone access. Sensitive Balloons float on command, sense their environment and take ‘selfies’ for their temporary masters, while personal cushions adapt to individual seating preferences. "Public Squares: The stage for evolving human history" was published in Inmun 360°, the magazine of the Korean Arts Council, in 2017.